Light curtains are used to protect passengers and goods when moving between the lift car and the landing. They are opto-electronic devices that can sense the presence of an object within their “detection zone”, directing the lift doors to reopen when triggered. AVIRE’s light curtains are used globally, and are installed in over a quarter of a million lifts each year. Light curtains are supplied as a pair of units: the transmitting and the receiving edges. The transmitting edge typically contains between 8 and 48 Infrared (IR) light emitting diodes (LEDs), sending horizontal and diagonal beams across the doorway to the receiving edge, which contains a matched number of photoelectric cells. These cells read the presence or, in the case of an obstruction, the absence of a beam and relay a corresponding signal to the lift car controller. 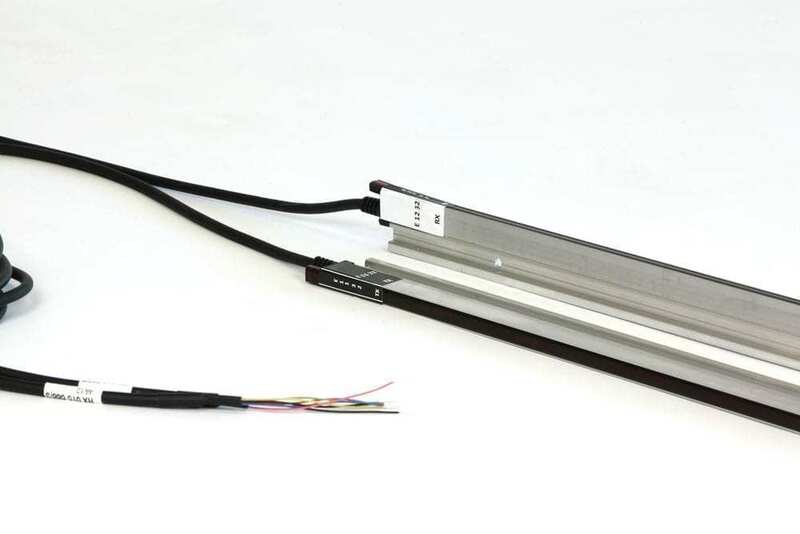 Therefore, when a horizontal or diagonal beam is broken by a passenger entering or leaving the lift, a relay in the receiving edge signals the change of state and the controller reopens the lift door. An increased number of LEDs and receiving photoelectric cells typically improves the coverage within the detection zone – more beams (or a higher beam density) allow for smaller objects to be detected regularly within this zone. The latest EN81-20 legislation stipulates that a 50mm object must be detected at any point in the detection zone. 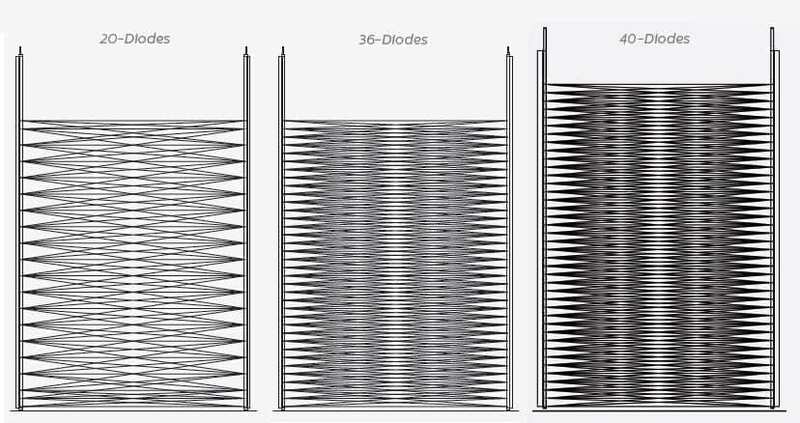 The beam pattern for AVIRE light curtains 1.2m apart with 20, 36 and 40 diodes can be seen below (Figure 1). The E10 36 and E10 40 products can detect a 50mm object at all points in their detection zones. Figure 1 – Beam patterns of AVIRE light curtains with 20, 36 and 40 diodes respectively, at a distance of 1200mm. AVIRE’s light curtains use IR light as means of detection. Therefore, it is important that precautions are taken to ensure that they are not susceptible to other light sources, especially those with a high IR component, such as sunlight. Light curtains must be also robust, with a resistance to humidity and particulate dust, as well as immunity to electromagnetic discharges and radio frequency interference. If the light immunity of the light barriers is not sufficient for a given application, the curtain may trigger without the presence of an obstruction or, more alarmingly, not trigger in the presence of an obstruction! Poor light immunity typically causes a reduction in sensitivity; meaning smaller objects may not be detected. In order to design a light curtain with good light immunity, we must first understand the nature of the interference itself. Figure 2 shows a characterisation of the solar radiation spectrum. It can be seen that, although the atmosphere absorbs a large portion of the sunlight energy, more than 50% of the solar radiation found at sea-level is IR. Looking closely, there is an abrupt reduction in the IR spectrum at the wavelength bands where it is absorbed by water. We therefore want to make use of detection at these wavelengths as the optical noise is significantly reduced. The photoelectric cells used to detect IR beams in light curtains generally require a pre-amplifier to enable detection of signals with as low as picowatts (one trillionth of a watt!) of light power. The most suitable LEDs and cells should be chosen to balance out a number of factors: the beams should not be visible, the interference from external light sources, such as sunlight, should be minimised and the cost should be economical. AVIRE’s curtains typically detect in the range 915-960nm, striking a good balance between the three. Artificial lights, such as the fluorescent bulbs found in many commercial buildings, can often degrade with time, leading to emission of IR light. AVIRE also test the impact of fluorescent lighting and strobe lighting (short, sharp flashes of visible and IR light) on the light curtains. Some details of AVIRE’s design engineering and its rigorous testing procedures are given below. So we’ve chosen the best diodes, how else can we improve our light immunity? AVIRE design light curtains to include both mechanical and electronic measures to enhance light immunity. How do the light curtain’s mechanics help with its light immunity? 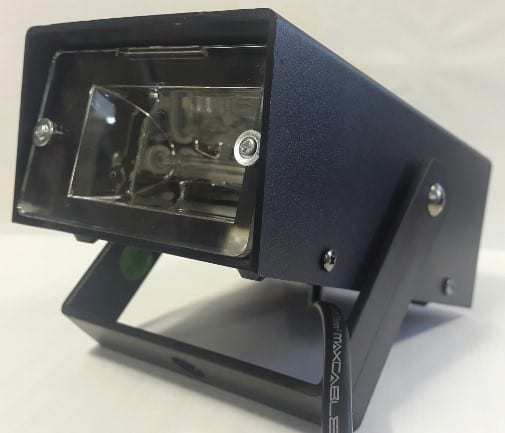 The light curtain housing, which is typically Aluminium or plastic, can physically block a portion of the incoming light, but the detector edges must still be able to communicate, leaving a gap in the housing. A filter is used to cover this gap, which absorbs part of the incident visible light. In some AVIRE products, the filter also acts as a lens, focussing the IR beams from the transmitting edge onto the receiving edge (Figure 3). This can result in significant improvements to both the detector’s performance and to its light immunity. This is because the lens focuses incident light from the transmitter onto the photodiode and deflects off-axis incoming light away from the receiver. 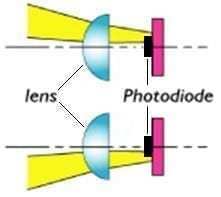 Figure 3 – Focusing Lens light deflection. How do the light curtain’s electronics help with its light immunity? In normal conditions, it is impossible to prevent all external light sources from reaching the receiver; we must therefore remove this digitally. All signals from the photoelectric cells pass through an electronic filter, which blocks the DC components created by unwanted light sources (i.e. everything with wavelengths below the Infrared spectrum). In addition to this filter, the light beams emitted from the transmitter are sequenced, one after the other, and modulated at a specific frequency. The receiver is designed to only accept the specific pulse and frequency from its dedicated transmitter (ie. it knows what to look for, and where to look). This enables the rejection of bogus IR light sources and enhances the efficiency of the system. Over the years, AVIRE has developed and improved rigorous test capabilities to meet national and international regulations. Each new firmware or product release is accompanied by extensive testing and multiple Quality Test Procedure (QTP) reports which includes a comprehensive set of tests dedicated to Light Immunity. 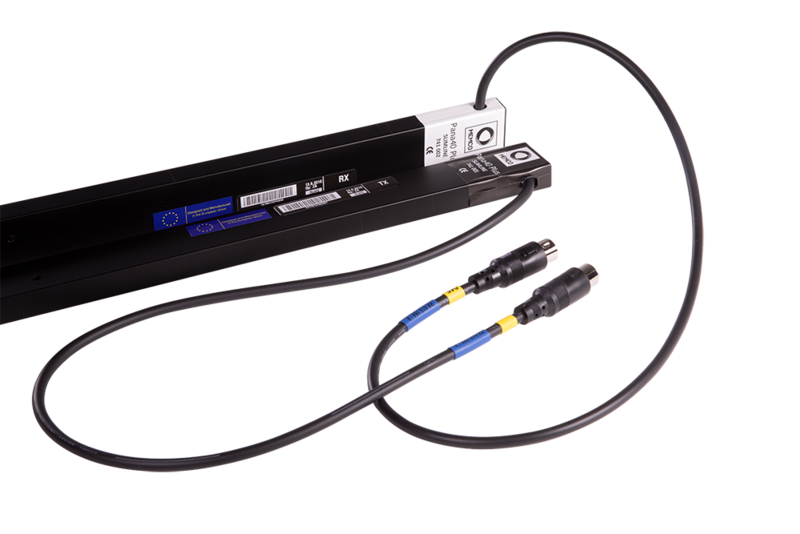 The Light Immunity section of the AVIRE QTP document is based, but not restricted to, the 61496-2 IEC:2006 British standard which defines and provides test procedures for Active Opto-electronic Protective Devices (AOPD) including light curtains. AVIRE uses six halogen lamps positioned as shown on the image on the right. These lamps are able to produce a continuous spectrum of light, from near Ultraviolet (UV) to deep into Infrared while delivering light of higher efficacy on the Infrared area of the spectrum. Although, there is no standard regulation of the minimum intensity required to pass this test, the industry assume a common value of 100,000 lux directly on the receiving edge (this value is very close to the maximum outdoor illuminance for direct sunlight at noon). AVIRE test equipment can test up to 400,000 lux. Figure 4 – Sunlight simulation setup. It should be noted that some light curtain manufacturers, who claim immunity up to 100,000 lux, do not shine the light as close as practical into the receiver but simply rely on the mechanical profile to block out the incident light. Historically, there were very few issues associated with fluorescent interior lighting. Recently however, with the introduction of electronic ballasts and Compact Fluorescent Lamps (CFL) there have been several trickier installations reported. Electronic ballasts modulate the output of a lamp at the ballast operation frequency. If the lamp operation frequency coincides with the operation frequency of the detectors then the performance of the light curtains can be affected. As a Fluorescent lamp gets closer to its lifetime limit it will tend to degrade in performance and give a different light output. 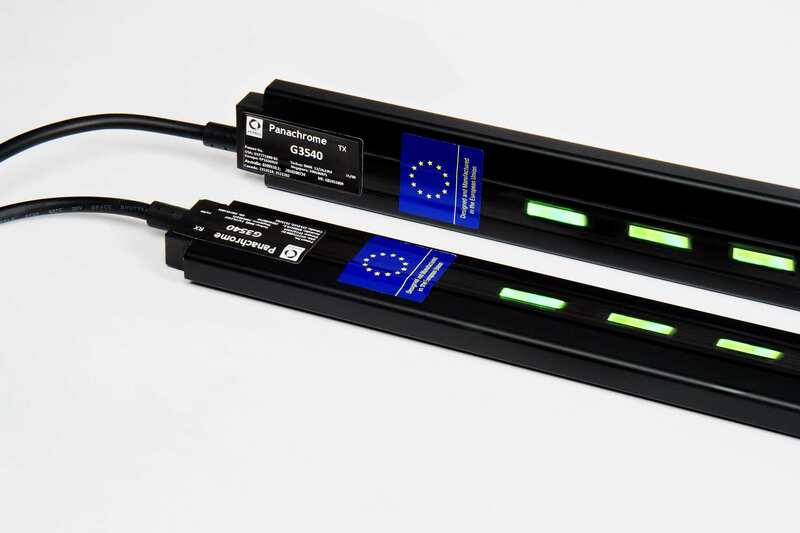 These End of Life (EOL) lamps are known to have high Infrared emissions, which can potentially also affect light curtain performance. Over time, AVIRE have acquired multiple ballasts and fluorescent lamps (including EOL), which are used in many of the test procedures. Some examples are given below. Figure 5 – ATU 107: End of Life (EOL) fluorescent lamp. Figure 6 – ATU 108: compact Fluorescent lamp (CFL). A Strobe light is a device used to produce periodic intervals of high intensity flashes of visible and IR light. AVIRE have developed and acquired light sources for this purpose as, for example, a Xenon-based Strobe Light pictured below. Figure 7 – ATU111: Xenon Strobe Light. It is not possible to block external light sources completely in every installation. Different installations present different challenges either due to the nature of the site (i.e. indoors or outdoors), the reflective material of the lift car interior (e.g. stainless steel, mirrors, etc.) or the presence of artificial and/or natural lights (e.g. sunlight, fluorescent tube). Irrespective of the conditions encountered onsite, it is important to note that light immunity issues can only be prevented by both high quality design and by extensive validation of light curtains using “worst-case” test procedures.